This will give you eight one inch, eight 4 inch, eight 14 inch, eight 27 inch, eight 20 inch, and four 8 inch pieces. The one inch pieces are to connect the tees as shown in the picture. 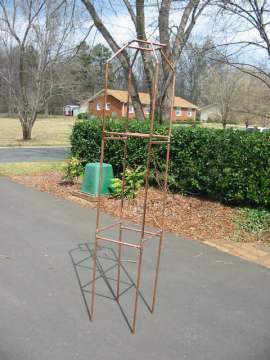 Assemble the trellis in the following order: The bottom section and the middle level use the 27 inch sections for the vertical pieces and the 14 inch sections for the horizontal pieces. The top sections incorporate the 20 inch pieces, the 45 degree elbows, and the 8 inch sections. The top “ring” is constructed of the 90 degree elbows and the 4 inch pieces and tees as shown in the picture. 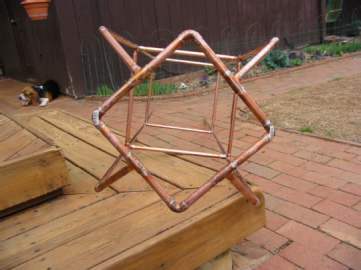 Use the “T” Square to check “squareness” and assemble the trellis before soldering. “Sweat” solder all the joints. By the way, if desired, you can achieve a nice verdigree finish by "painting" the trellis with a mixture of vinegar, salt, and miracle grow.